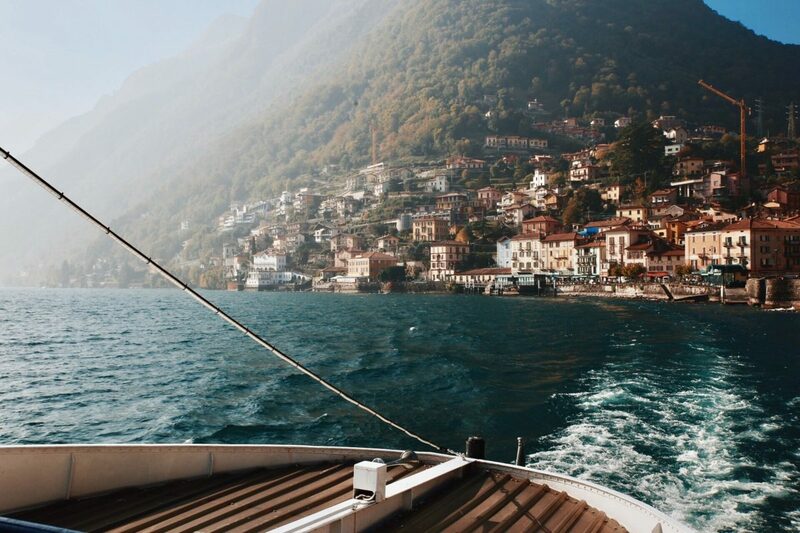 Views from the ferry in Lake Como, Italy. 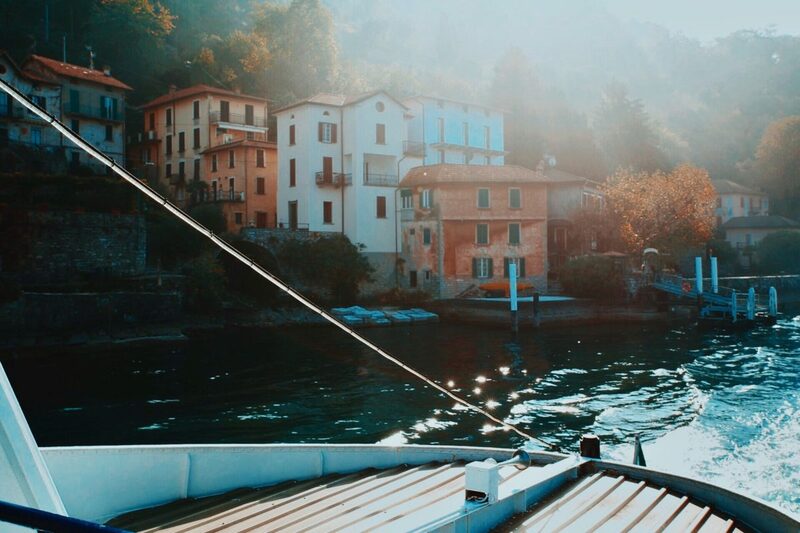 While largely overlooked in winter, the colder months are a romantic season on Lake Como. From October to April, as prices drop and tourists depart for Italy’s southern coast, local life resumes in the dozens of villages that hem its shores. The harbors and squares lay empty, and feel miles apart from the flashy revels of summer—think tourists hovering over ferry bows for snaps of villas owned by Russian heiresses and American celebrities. The lake’s seclusion, an hour north of Milan at the foot of the Alps, makes it particularly appealing under a fresh coat of snow, especially for ski and winter sport enthusiasts who want to get away from the madness of Alpine resort towns. The lake never freezes and is best explored by ferry. Visitors usually arrive by air through Milan, where they are then carried by train to Como’s San Giovanni station on the water’s southern tip. 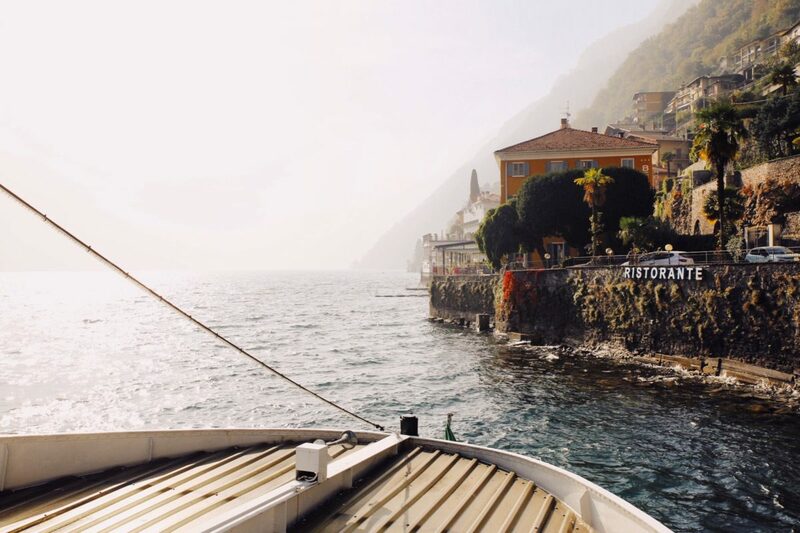 From there, unhurried ferries sail across the blue water, towards the steep hills to the north dotted with citrine and salmon colored villas, ready and waiting to be explored. While most of the grand resorts are closed until spring, smaller hotels are open year-round and promise a more intimate stay. Just meters from the train station, Vista Palazzo Lago di Como overlooks the lake and is decorated in bold emerald and cerulean tones that mirror the natural splendor of its surrounds. (From $650 offseason/$900 peak). 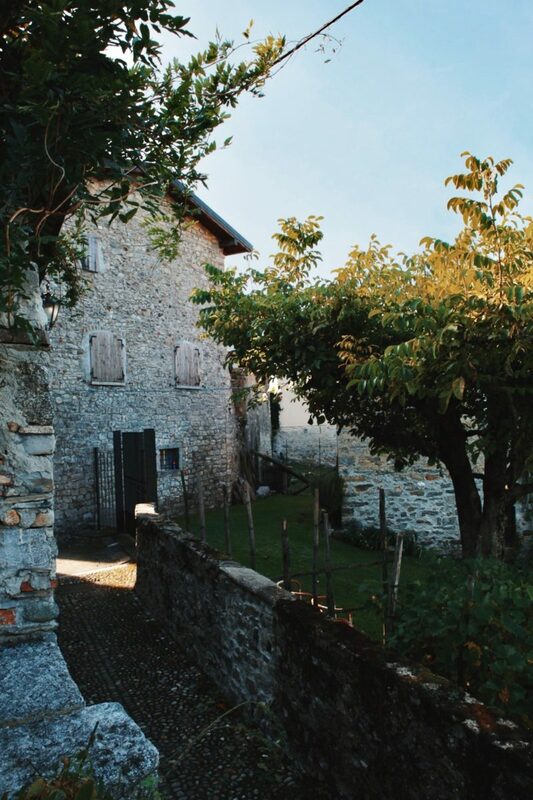 The Relais Villa Vittoria sits on the western shore in Laglio, where guests sip aperitivos on a garden terrace that stretches to the water’s edge. Once a silk production workshop, the 19th century villa features a Moroccan-style spa and just 12 airy, pastel-hued rooms (from $125 offseason/$250 peak). Flights to Milan’s Malpensa airport run from NYC at $350 in the offseason and as high as $900 in peak season. 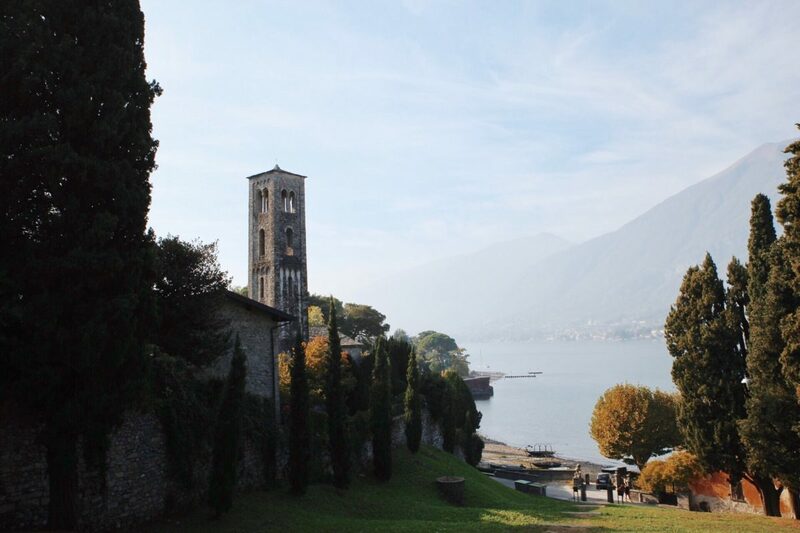 Views of Lake Como and Chiesa Santa Maria di Loppia church from the foothills of Bellagio. Prepare for the breeze on board ferries with warm coats and soft knits, but if you’ve forgotten anything at home, Moresi or A.Gi.Emme stock timeless Italian staples. For something more dapper, head to the many luxury boutiques (Armani, Jimmy Choo) sandwiched between gelato shops. Cobbled alleyways and stone cottages in Bellagio. 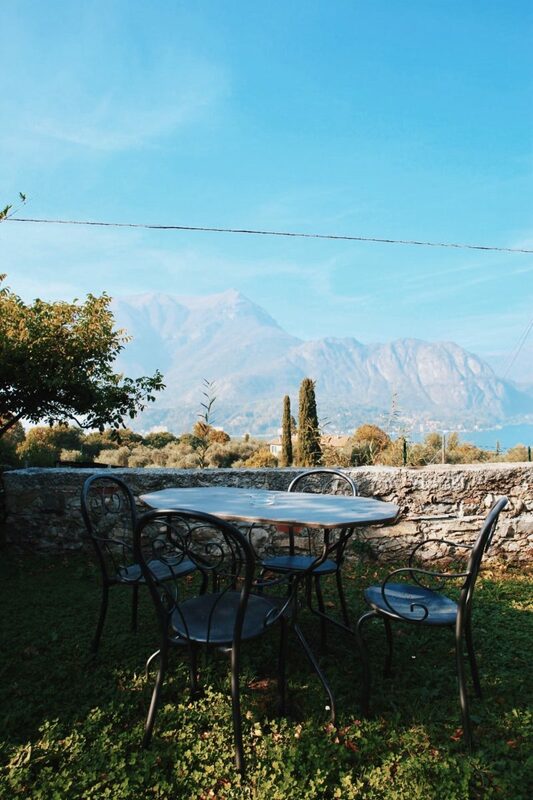 Terrace overlooking the lake from Sara Luperto's Airbnb in Bellagio. Tour the Villa Monastero in Verenna, a 12th century monastery turned noble’s residence surrounded by botanical gardens. Find some old world charm in Bellano’s La Ca di Radio Vecc, a tiny museum of old gramophones. Discover the lake’s silk trade history at Como Silk Museum and Fondazione Antonio Ratti. For more contemporary tastes, Como’s version of Bansky—Mr. Savethewal—displays street art painted on wood planks and other repurposed material in his gallery in Como. Start the day with espressos at Café Monti in Cavour Square, then feast on fresh fish at Restaurant Momi in Blevio overlooking the water. Try the pizzoccheri alla valtellinese (buckwheat tagliatelle, cabbage, sage, potatoes and cheese) at Carillon Restaurant in Bellagio, a regional specialty that’s an unusual but hearty accompaniment to the chill. After dinner, head to Bar Rossi across the port for red wine and homemade tiramisu. 30 minutes from the lake, resorts in Valsassina and Valtellina are the local choice for skiing and snowboarding, while the trails of Mount San Primo are best for snowshoeing. Mount Sighignola is known for beginner’s slopes and stunning views of Lake Lugano over the Swiss border. If you rent a bike, the paths between Cernobbio, Carate Urio and Argegno are unmissable. For hiking, take the funicular from Como to the mountain village of Brunate for a mile-long trail that snakes 1,600 feet above the lake. Warm up with a hot stone massage at Relais Villa Vittoria’s hammam spa, followed by a dip in the Jacuzzi overlooking the water. For a day trip, the Alpine village of Bormio just two hours north is home to the Bagni Vecchi (old baths), Bagni Nuovi (new baths), and Bormio Terme (the spa)—an ultra-lux wellness resort with mineral-rich thermal baths and hot springs overlooking the Dolomites peaks. On some days the best thing to do is precious little. Meander at a leisurely pace, get lost along the cobbles, rent a Riva boat and set sail. Find a terrace and watch the boats glide into the port. Marvel at the views that have been immortalized in art for centuries, from the poems of Virgil to the screenplays of Hollywood. Leaving the port of Argegno village. Cream and terracotta villas on the shores of Lake Como.